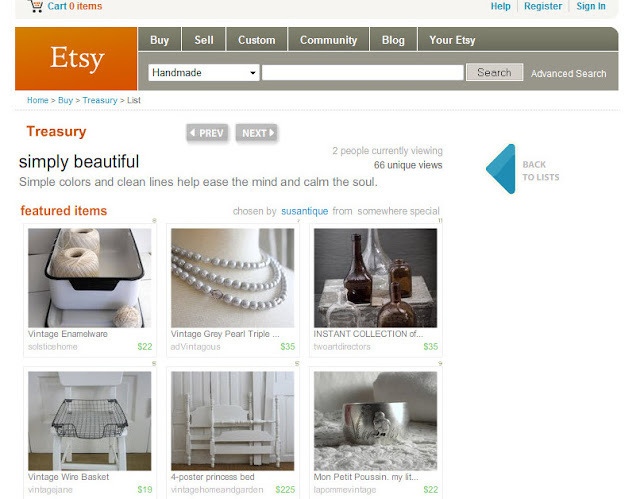 and it feels so good this morning to know that Etsy loves me, too! I woke up yesterday morning to find this in my inbox.. I am blushing...because that is my bed up there on display! My bed?? I am sure most of you don't even know I have my own business painting furniture. I sell to a number of designers, stores and my favorite...the Kane County Flea Market in St. Charles, IL...May-October. I don't even tell anyone I sell online...but I guess now my secret it out! I have only listed about 6 pieces of furniture...how pathetic...thats why I never say anything. Not much of a show to put on with 6 pieces! I am embarrassed to even mention it, to be honest with you. I am so busy with custom orders...getting ready for my first show in the Spring...and trying to finish my own house...things just never seem to make it to Etsy. I put a piece up here or there just for fun. I want to do more...I really do. But picture taking in a nightmare for me...but thats a whole other post. Thanks to my new BFF Tara, I think I may be getting the hang of indoor shots in my "shady" home...so watch out! If I do figure this camera out I am going to wear you out on home shots, project makeovers and furniture listings! So where am I going with this...I am blushing because I was featured in an Etsy treasury again and I feel a proper 'thank you' is in order! THANK YOU SUSAN! That makes 6 features so far...and I have only listed 6 pieces. How funny is that? I am really thinking...why me?? 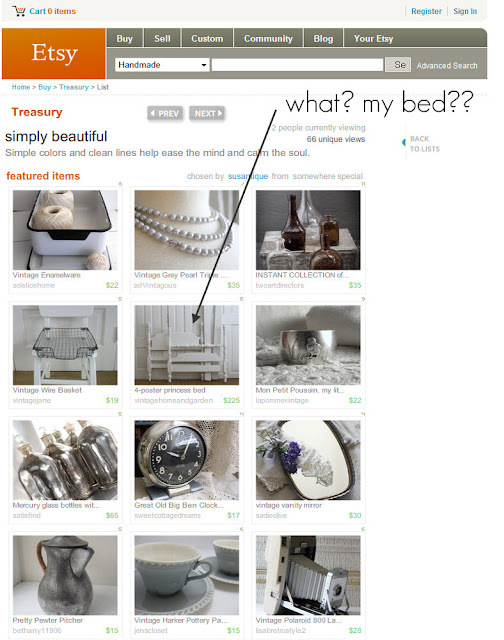 There are so many fabulous things on Etsy...how are you finding the girl with only 6 things posted? How awesome are those girls out there in Estyland, anyway??? They sure know how to make a girl in the middle of IL freezing her tail off with a paintbrush in her hand feel soooo good! I feel like I need to give a little speech like Sally Field..."you like me, you really like me!" Just take a look at the fantastic company my little bed is keeping up there! Those mercury glass bottles make me want to pass out...and that camera is the most fabulous thing...I just may have to have that for a shelf in my office! So again, THANK YOU SUSAN...maybe you have just lit a fire under this girl to get her act together and take more time to make her Etsy store pretty...and actually fill it up! Funny how we can do such little things in life, and they end up meaning so much. This has meant so much to me...as trivial as it may be. Sometimes we just need a boost! Wishing you all a fun, sun filled weekend! That's so exciting and rewarding. I'm happy for your success and accomplishment. Hey lady, you seem to work hard so you deserve it. You are Queen (at least for a little while)! That is great, good for you. How very exciting! Very deserved as well - that bed is gorgeous & I love the background it's on as well! Yeah for you!!! that is so awesome, and that treasury is simply breath taking, and that camera, well it is calling my name too, and I will fight you for it! :) Thanks for the shout out, my new BFF!! I hope you do start showing us your home cause I have a feeling is it BEAUTIFUL! happy Friday sweet Mary! How exciting! Congrats! I am quite jealous of your job - I am always droolin over furniture I see in thrift stores and antique malls, just envisioning how perfect it would be with a little sanding and a new coat of paint or stain! How did you get started in this little venture if you don't mind me asking? Good for you! What a fun surprise that must have been! I haven't spent much time poking around on Etsy. I need to make time to do that one of these days, although it's probably like shopping at Target -- don't go unless you are prepared to buy! Congratulations, Mary! Happy Friday to YOU! You deserve to be up there! What an amazing assortment of things...just dreamy... You must share your photo tips, my main living area is lit like a cave and I can't get a decent photo... Have a happy weekend! I ordered your other bed Tuesday that was listed on ETSY...the four poster girly girl bed for my two year old's new "big girl room"! I fell in love with it when i saw it. Just what i was looking for to go in my Princess' room! I can't wait to get it!! Congrats to you! It certainly looks like you deserve the recognition. Mary!!! Congratulations!!! I am so so so very HAPPY for you! You have a wonderful talent and nothing you should be embarrassed about at all! How wonderful your bed is!! !